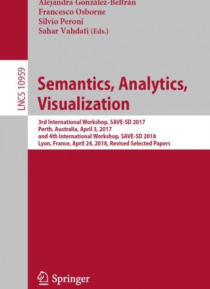 This book constitutes the refereed proceedings of the 3rd International Workshop, SAVE-SD 2017, held in Perth, Australia, in April 2017, and the 4th International Workshop, SAVE-SD 2018, held in Lyon, France, in April 2018.�The 6 full, 2 position and 4 short papers were selected from 16 submissions. The papers describe multiple ways in which scholarly dissemination can be approved: Creating struct… ured data, providing methods for semantic computational analysis and designing systems for navigating. This allows a variety of stakeholders to understand research dynamics, predict trends and evaluate the quality of research.